Arts therapy for individuals – adolescents, young people and and women. Individual and group sessions for people who feel “stuck” or “blocked” or enjoy creativity. 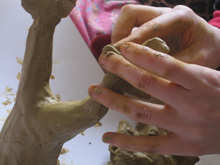 A typical arts therapy session involves 2 parts to the arts therapy process. The first part of the session is about using the art materials to express and give form to an area of concern or a presenting problem. The second half of the session is where the art image is explored by the ‘art maker’ and the arts therapist which deepens the process. Arts therapy bypasses rational thinking and uses the body’s wisdom to provide information about the area of concern which is out of ordinary awareness. By employing the body actively you tap into the source of the problem, release stress and tension and feel better. I will really listen to your needs and we will work together to bring about the changes you want. You will feel safe, supported and you will most likely have some fun! The length of a typical session is 1 hour in duration. All art materials are included in the cost of the session. No art skill or previous art experience required to receive the maximum benefits. Locations: Monday and Wednesdays – Abbotsford, Thursdays and Fridays – Werribee. In the creative play session with your child, your child will be invited to express and explore their feelings, thoughts, experience and behaviour in a safe and supportive environment through the use of toys and creative play. In this way, the child is invited to work through issues that they cannot change or that they cannot understand through visual, kinesthetic and the sensory experience of using art materials and toys. The ‘Happy kids, healthy families program’ includes 8 x 45 minute sessions with your child, helping tip sheets for families, a parenting group, regular phone catch ups with parents, and email support. For more information about this program contact Nyrelle. I hold a current Working with Children Check and a valid Police check. Is your child anxious, depressed, sad, withdrawn or ‘out of control’? Then this group is for you! A 10 session group to help parents understand the behaviours of their child and generate change from the inside-out. Professional supervision is an important compo nent to an arts therapist’s professional practice. It is recommended that all arts therapists engage in arts therapy supervision with an approved arts therapy supervisor to maintain their registration and membership with ACATA or ANZATA. Nyrelle offers individual and small group mentoring and supervision for arts therapists and counsellors. She loves to support newly graduated arts therapists build a private practice, or find their niche as an arts therapist through mentorship/supervision. Location: Abbotsford Convent, St Helliers Street, Abbotsford and 4/3 Synnot Street, Werribee. This arts therapy group is for women aged 18+ who would like to use art and their own creativity to foster, maintain or improve their physical and emotional health and wellbeing in a safe, relaxed, informal and creative setting. The group sessions will focus on using a variety of arts media and arts therapy techniques to facilitate and promote: self expression, relaxation, self discovery, happiness and the integration of experiences. Each session will focus on a particular theme. Every group session will include time for art making, time for reflection and journalling and time for sharing.